Amsoil Provides Premium Quality protection for Heavy Duty Diesel Trucks that Demand Performance, Longer Change Intervals, Increased Fuel savings of Up to 6.5%. With Amsoil Diesel you can also experience better performance in extreme cold weather! OTR Diesel Applications can experience up to 3x's the manufacturer drain interval, not to exceed 30,000 miles, 700 hours or 1 year which ever comes first. Max Duty Signature Series life is 3x’s OEM, not to exceed 60,000 mile, 600 hours, or 1 year whichever comes first. Turbo Diesels 2x’s OEM, not to exceed 25,000 miles or 1 year. 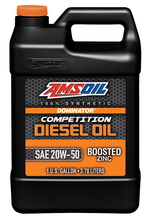 Heavy Duty Diesel oils follow the OEM guidelines for drain intervals. AMSOIL THE FIRST IN SYNTHETICS!